- Oats contain soluble fibre called beta glucan, which is known to help in reducing cholesterol by the blocking of re-absorption of cholesterol when it passes through the digestive system. 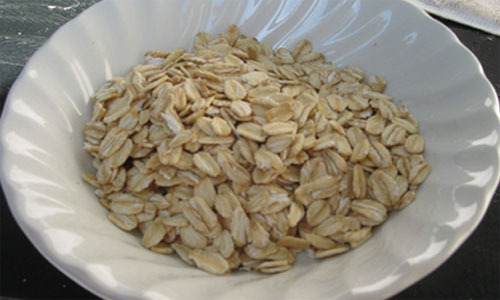 Regularly having oats lowers the cholesterol levels in the body. - Oats contains low levels of sodium. This reduces the risk of contracting high blood pressure and hypertension. - The soluble fibre present in oats tends to slow down the digestion of carbohydrates, thereby reducing the spikes in the blood sugar levels, which in turn do not lead to unwanted urges to eat. - Eating oats leaves one much fuller, therefore you tend to eat less. This is especially good for those trying to lose weight. - Oats contains very less amount of fat and lesser calories. This makes it good for overall health. - Being a good source of natural dietary fibre, oats are beneficial in curbing the problem of constipation. - Oats are also known to contain compounds called phytochemicals that can reduce one's risk of cancer.